Namasu roughly translates to "raw vinegar" and refers to the Japanese raw vegetable and rice vinegar salads I grew up eating in Hawaii. Namasu is served cold and can be made of a variety of vegetables, including cucumber, daikon, carrot and celery. You can add a protein, including shrimp, crab, chicken or even octopus. This cucumber and shrimp version of namasu is a favorite of my friend Lockie. Namasu has a fresh clean taste that comes from balancing the vinegar with a pinch of sugar. Some cooks use lemon instead of vinegar and honey instead of sugar. Some recipes call for salt. I like to add a few drops of toasted sesame seed oil to enhance the flavor. 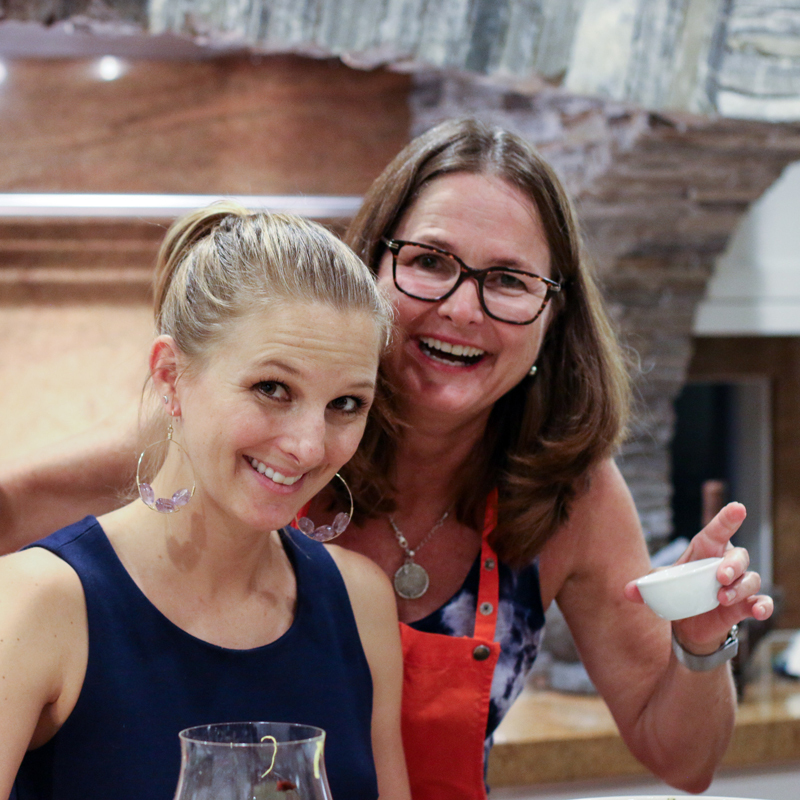 Some cooks add a splash of hot chili oil. The trick is making ultra-thin slices of cucumber using a vegetable slicer. The trick is to catch a bit of the cucumber peel in each ribbon so you get a beautiful long white strip with a thin stripe of green on the edge. 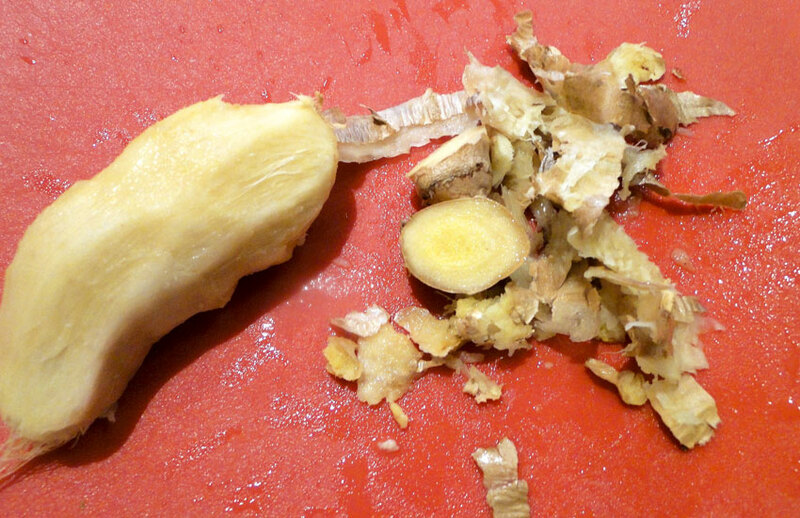 Check out my tip on how to peel ginger. 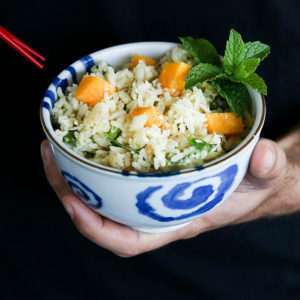 You can use black or white sesame seeds. The black ones look cool and provide a nice contrast against the pink shrimp and white and green cucumber. Whichever you use, you will get more flavor if you briefly toast your sesame seeds in a pan. Refreshing, light and easy, cucumber and shrimp salad is a great side to a grilled fish or teriyaki-style meat or shoyu chicken. 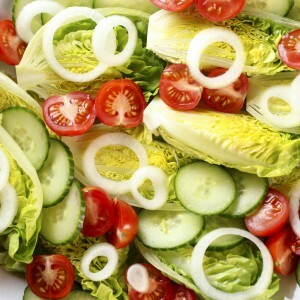 Thinly slice the cucumber into ribbons using a vegetable peeler. 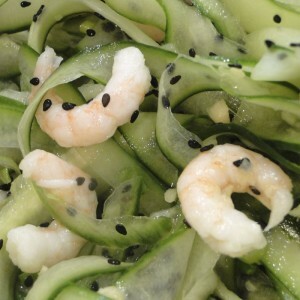 Put cucumber ribbons, green onions, shrimp and sesame seeds in a mixing bowl. 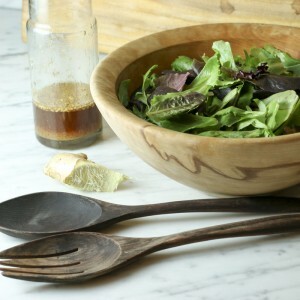 Put vinegar in a small bowl and whisk in sugar and sesame seed oil. Add ginger and mix. Toss vegetables and shrimp with dressing. 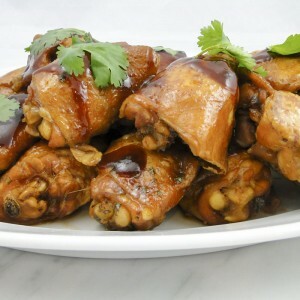 Refrigerate for at least 30 minutes before serving. Refrigerating longer is better.